(5:30 p.m. EDT) -- British cruise line Fred. Olsen, well-known for the itineraries offered on its four small ships, has developed a website geared toward attracting American passengers. At a press event in New York this week, representatives from the company, owned by a Norwegian family, said they believed the line's focus on destinations and small ships will attract interest from Americans. "U.S. marketing begins today," said Nathan Philpot, sales and marketing director at Fred. Olsen. 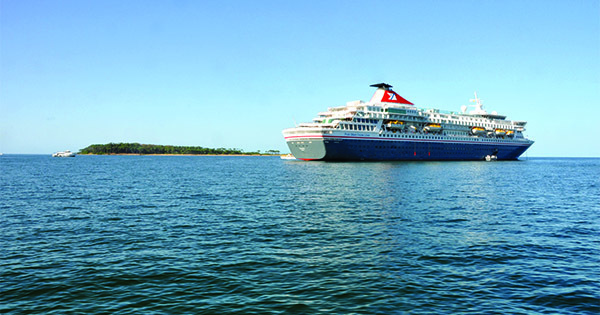 The line's website, fredolsencruises.com, converts British prices into American dollars and has U.S. phone numbers for potential customers. Only about 2 percent of the line's current passenger base is American, Philpot said. The four ships in the fleet -- Balmoral, Braemar, Boudicca and Black Watch -- will not be modified or adjusted for Americans, however, he said. Instead, the line is selling the cruises as a British experience. "We want to be as British as we can be onboard," he said. Unfortunately for the launch, U.S. journalists and other people invited to the press conference were not able to tour Balmoral, which was docked in New York as part of a 34-night cruise. The ship has been fighting an outbreak of norovirus that at one point affected 17 percent of its 921 passengers. Another 20 passengers became sick Tuesday night. In a statement released Wednesday, the line said it had been "undertaking extensive sanitization measures and cleaning of the ship." Despite the hiccup, Philpot praised the line for its destination focus; other lines that focus on destinations, such as Oceania and Azamara, have a much higher price point than Fred. Olsen, he noted. The size of the line's ships, between 800 to 1,300 passengers, as well as reasonably priced drink packages and no gratuities imposed on bar tabs, also may appeal, he said. When asked to point to a signature itinerary, Philpot called out Norway, the home of the line's founders. In addition, the line is offering "set jetting" cruises around Britain to movie sites, unusual itineraries in the Indian Ocean, cruises to the Canary Islands and a robust lineup of Scotland tours. Another reason to give Fred. Olsen a look is its dedication to solo travelers, Philpot said. Each ship has between 40 to 50 cabins for single occupants, across all categories; the single supplement is usually around 20 to 30 percent, as opposed to the 100 percent that solo travelers often find. In getting the word out about Fred. Olsen, "we will try to showcase what we do really well," Philpot said.